The Zero Emission Urban Bus System (ZeEUS) project was officially launched in Brussels on 23 January by UITP. The event was held in the Palais des Academies, across the street from the Royal Palace in the centre of the city. 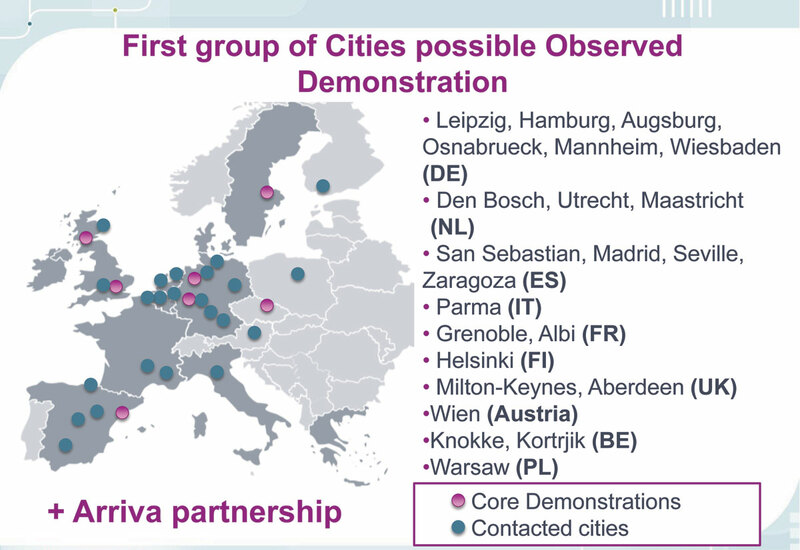 UITP is playing an important role in co-ordinating 40 organisations in an innovative project to extend the development and use of fully electric vehicles to European urban bus networks. The project has a budget of EUR22.5m, of which EUR13.5m will be contributed by the European Union. UITP selected 40 partners that, between them, have all the skills and experience necessary for the development and use of large capacity electric buses in Europe. They included manufacturers, systems and infrastructure suppliers, operators and transport authorities, electricity suppliers, universities, research institutes and consultants. The United Kingdom is represented by Alexander Dennis, Scottish and Southern Electricity, Strathclyde Partnership for Transport, Transport for London and the Transport Research Laboratory. Alain Flausch, Secretary General of UITP, welcomed the audience and introduced the speakers. His immediately previous job was CEO of STIB, the Brussels public transport operator, so he has first-hand experience of the challenges that will be faced in the project. He was confident that electricity will play a major part in the future of urban transportation. The first speaker was Fotis Karamitsos, Deputy Director General, DG Mobility and Transport of the European Commission. He said that Europe was far too dependent on oil, spending one billion Euros every day on oil imports! Electrification of transport was necessary to reduce oil consumption and emissions. Good progress had been made on the development of electric cars, but they were not a substitute for public transport. He emphasised that ZeEUS was not a research programme, but a practical downstream project. Admitting that he was not always diplomatic, he surprised the audience by saying that there were too many suppliers and that their numbers needed to be reduced in order to get prices down. This would achieve more standardisation that would benefit transport operators. I wonder how that sentiment would be received by his colleagues in the Competition Commission! The next speaker was Sir Peter Hendy in his twin roles of President of UITP and Commissioner of Transport for London. He praised UITP for being an excellent platform for spreading knowledge. Air quality guidelines in many cities are not being met, yet, every day in the European Union, public transport caries 200 million people. Electric vehicles, in the form of trams, trains and trolleybuses, already carry around 90 million passengers per day in the European Union but buses remain the prime provider of public transport with 60% of total passenger movements. While acknowledging that no new technology was risk free, he said that Transport for London, with the help of ZeEUS, would take up to four electric double deck buses in the near future. The main presentation was given by Umberto Guida, Director EU Projects, UITP. He has been responsible for setting up the project and will be in charge of the 42-month demonstration period. His presentation was lively and fast-moving, but he kindly gave ‘Bus & Coach Buyer’ a copy and some of his slides are reproduced here. Electro-mobility in public transport was not a new subject. UITP’s Berlin Congress in 1886 discussed the high cost of maintenance of horses against electrically-powered trams! He said that, for the ZeEUS project, there was a large set of available technologies. Already, in Europe, there were full size trolleybuses, mini and midi battery buses, and full size diesel–hybrid buses. The project had to consider cost elements, technical and operational aspects, feasibility and environmental benefits. One of the targets of the ZeEUS project was to provide decision makers with guidelines and tools to support decisions on ‘If’ ‘How’ and ‘When’ to introduce electric buses in the core bus network. He said that demonstrations should not use prototype vehicles, but series or pre-series products. The number of demonstration vehicles had to be enough to perform a meaningful and statistically valid evaluation in different geographical, climatic, environmental and operational conditions. The Core Demonstrations had been selected from 35 candidates. Umberto Guida said there would be eight demonstrations in six countries. He named the cities as Barcelona; Bonn and Munster in Germany; Glasgow and London; Plzen in the Czech Republic; Stockholm; and an Italian city that still had to be determined. Between them, they would operate 35 high capacity buses that were either full electric or plug-in hybrid. The project would evaluate the charging infrastructure, such as slow charging at bus depots, fast charging at bus stations and terminals, and various kinds of contact systems. Next, he revealed the six chosen manufacturers as Alexander Dennis, Irizar, Skoda, Solaris, VDL and Volvo. That immediately had some of the audience trying to match manufacturers with cities. At Coach & Bus Live in Birmingham last year, Colin Robertson had already announced a Scottish consortium consisting of his company, SPT, Scottish and Southern Electricity, Strathclyde University and others to develop virtual electric buses that could be available at the end of this year or early 2015. At that time he said the technology would involve a combination of on-route recharging, via electric induction, and hybrid know-how. It would provide the first clean-air bus truly capable of meeting the gruelling 18-hour shift expected of bus operators and it would do so while running 70% of the time emission-free; the other 30% being on hybrid power. 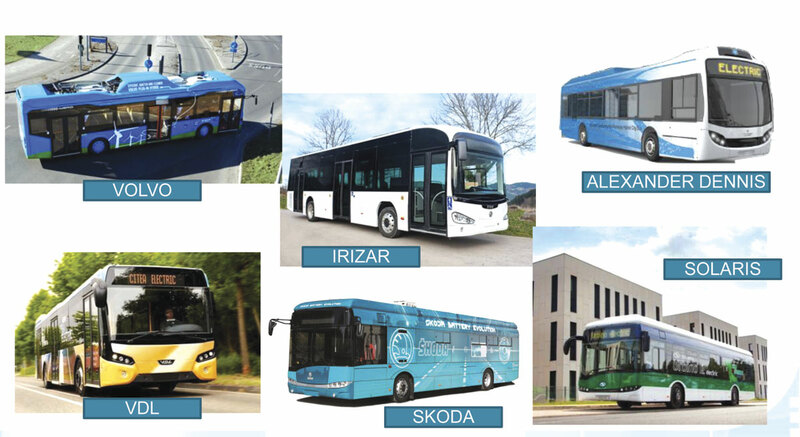 It has previously been reported that Irizar is developing an all-electric city bus for demonstration in San Sebastian and has secured an order for two units from TMB, Barcelona. VDL will supply its Citea electric buses to Munster. Skoda has developed an all-electric bus using a Solaris structure, so it must be the favoured candidate to supply its home city of Plzen. Volvo will supply eight buses to Stockholm, with the first two being delivered in the summer and the full fleet due into service before the end of the year. The catenary that is currently fitted on the roof of the 7900 plug-in hybrid will become part of the overhead recharging gantry for this project, saving a little bit of weight and cost. Solaris would appear to be the supplier to Bonn, and might be the front runner to supply the as yet unknown Italian city. Concurrently, UITP will also closely monitor electric bus deployment around the world. It will look not only at current practices, but new technological or behavioural developments. These will include the recently delivered fleet of all-electric StreetLites in Milton Keynes, and the forthcoming operation of fuel cell hybrid buses in Aberdeen. The ZeEUS project would develop strategies for optimised interaction with the power grid, including slow charging overnight and fast charging during daytime. It would identify priorities for standardisation, for instance on interfaces with the electricity grid. It would look at issues like driver training and maintenance. The conference then divided into two sessions. The VIP and press visitors went outside for a technical visit to the VDL Citea electric and the Volvo 7900 plug-in hybrid. I preferred to remain in the hall for a very interesting panel session, moderated by Elios Pascual. He was the first Chief Executive of Irisbus, until he retired, but has since worked with UITP as a Strategic Advisor on a number of projects involving the manufacturing industry. UITP had brought together a panel of five experts who represented various partners in the ZeEUS project, including public transport authorities, public transport operators, manufacturers, university and research centres, and last but not least, energy providers. Jens Plambeck represented Stockholm County Council Transport Administration. As a former submarine commander, he knew that electrical systems had to be totally reliable, especially at a depth of 300 metres! He said that there was a political goal to achieve a 10% reduction in fuel consumption in the Swedish capital by 2016. There were already buses running on gas and ethanol, and the introduction of the eight Volvo vehicles would be a further step towards that target. Gunnar Lorenz of Eurelectric said that energy providers had to ask how electric buses were going to affect the grid and the supply of electricity. They would have to understand the implications of recharging large numbers of all-electric buses overnight in a depot, and the impact of that demand on their supplies and their obligations to other users of electricity. The EU had introduced a target of 40% reduction in greenhouse gas emissions, and that had major implications for electricity suppliers. Dr Juhani Laurikko, from the VTT Technical Research Centre of Finland, representing universities, research centres and consultancies, said that they were keen to participate in the ZeEUS project. They had to be less academic and become more practical to make a major contribution. Elios Pascual asked if the introduction of all-electric buses would give the industry the opportunity to change public attitudes and perception of buses. The panel agreed that passengers must get a good experience of electric buses and must want to use them. Electric buses were totally different from electric cars that might be used on average for 45 minutes a day. An electric bus needs to be in service for 15-16 hours every day. Questions and observations were invited from the audience. Surprisingly, in view of the stiff targets to reduce emissions, no one asked how or where electricity was produced. One delegate suggested that, if governments saw tax revenue from petrol and diesel declining, they would be strongly tempted to tax electricity used in road vehicles. Another said that city authorities had to pay much more attention to bus routing and traffic management, with more bus priorities, to make journey times more attractive and to reduce operating costs. Stefan Baguette said that, after the transition to Euro6, manufacturers would find working on electric buses much more simple! It was important to establish standards, particularly on interfaces between vehicles and electricity supply systems. However, he warned that the industry would not want to standardise before it knew what would or would not work. UITP has to be commended for taking the leading role in the ZeEUS project. ‘Bus & Coach Buyer’ is not political, even though we labour to file copy on time, are liberal with the length of some of our articles, and conservative about predictions! So let me make a political observation. There is quite a large body of opinion in this country against the European Union and even in favour of pulling out. The entire conference was conducted in English. English has become the working language of the European Union. We are by no means the only member upset with EU regulations, but we must surely benefit from projects like ZeEUS. All the members need to curb the excesses of EU officialdom, and that can only be done from the inside. As mentioned earlier, the only all-electric vehicles were parked outside the Palais as static exhibits. It is unfortunate that they were not used on demonstration circuits, but that is only a minor complaint. The ZeEUS project will not produce results overnight, but it is a very important and promising step towards the widespread use of a totally new generation of all-electric city buses.